Digital comics are doing brisk business and in the last month we have seen sweeping changes in the industry. Amazon purchased Comixology and Thrillbent released a digital comic store. iPad and iPhone owners have a massive amount of disdain for Comixology pulling the ability the buy comics and instead are prompted to visit this website. This was done to phase out the 30% commission Apple generates on each sale. For now, the Marvel app, which is powered by Comixology still offers the ability to make in-app purchases. Until the Marvel contract with Comixology is renewed, things should stay normal for now. Still, Marvel is preparing for life after Comixology in order to have more control over their digital distribution. The augmented reality app Marvel AR has been received by a mixed response. There are currently 1400 videos and bonus features that you can access by buying the physical issue of the comic. By using the camera on your phone or tablet you can get bonus material, such as animations, commentary and music. In order to radically differentiate themselves from the competition Marvel has added a few new tricks into their AR app, which they integrated into the Unlimited platform. Adaptive Audio borrows elements from Firelight Technologies, who have a music engine commonly used for video games called FMOD. This is the same sound engine that BioShock and Guitar Hero employ and allows Marvel to develop a soundtrack for comics. 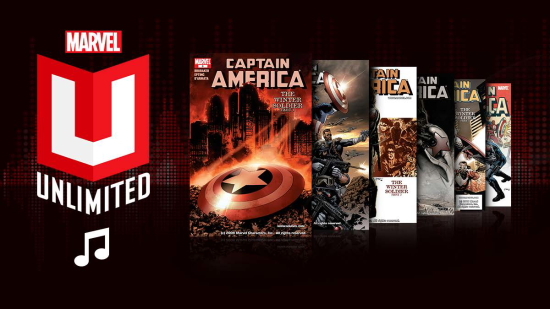 The music is user controlled and is showcased in the recent reissues of “Winter Soldier” by Ed Brubaker and Steve Epting. There is also some free content for users to check out with Captain America #8 and the Marvel AR version of Avengers #1. Marvel is heavily investing in their own technologies that are powered by their own comic reading engines. This allows them to easily integrate AR into their Marvel Unlimited subscription service and consistently make enhancements. The digital team is solely responsible for development and adding new comics into the system. The one thing preventing Marvel from being an end-to-end company is the current deal with Comixology. In May 2012 Marvel renewed a multi-year distribution contract. The contract has some major provisions that clearly state that Comixology will power the Marvel apps for Android and iOS. They also maintain the web-version of the Marvel storefront and use a common login system. One of the big drawbacks is that Marvel is actually prevented from selling single issues themselves until the contract has expired. Now that Amazon are the owners of Comixology Marvel is likely not going to renew their single issue contract. Likely Marvel is going to see diminished sales via the official Comixology app. Not being able to buy anything through the app will daunting for the average consumer. If Marvel does renew the digital agreement they are likely to add a provision for Comixology not to be solely responsible for single issue sales. It would be in the publishers best interest to sell and distribute the comics themselves for maximum profit. One of the barriers for Marvel to go it alone is the fact Comixology uses their own login system for the Android and iOS versions of the Marvel app. After the contract was renewed in 2012 Marvel abandoned their own login system and elected to use the universal Comixology edition. So, Comixology has all of the Marvel users credentials in their own system and likely Marvel does not have access to these. So if Marvel decides to sell single issues themselves and abandon Comixology they will be hard pressed to inform all of their users. The future of Marvel digital looks bright. They secured the comic license for Star Wars and will likely invest a ton into the production of enhanced versions. This beings in 2015 and is likely the year their agreement with Comixology expires. This might be great timing for Marvel to reinvent themselves and shoulder the burden of total distribution and start sourcing single issues to Apple, Barnes and Noble, Google and other companies as DC recently did.